One of the most intriguing games in the state features No. 5 Topeka High at Lawrence Free State. The Trojans and Firebirds are among the short list of contenders to represent the western side of the bracket in the Class 6A state title game later this fall. The game highlights the somewhat untested Trojans against a solid Firebird team that has won five consecutive games since opening the season with three losses. Those losses by Free State were to Shawnee Mission West (34-26), Olathe North (24-20), and top-ranked Lawrence (14-12) – teams sporting a combined 22-2 record entering this week. 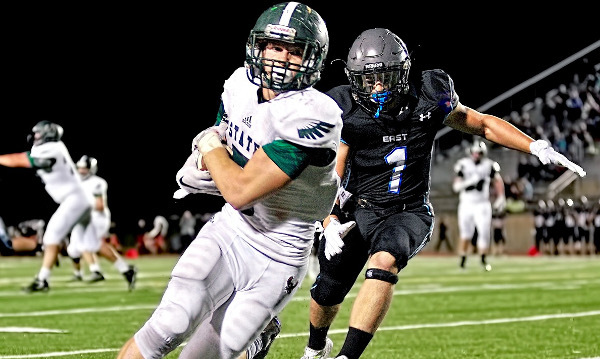 Free State then solidified itself as a contender by ending defending champion Shawnee Mission East’s 17-game winning streak with a 32-20 win back in Week 5. Offensively, the Firebirds are led by dual-threat quarterback Bryce Torneden. The 5-foot-10, 185-pound senior is a dynamic playmaker that can beat you in a number of ways. Sam Skwarlo remains another primary threat out of the Firebird backfield. The key for Free State may be its defense which has surrendered just 15.7 points per game against some of the state’s top competition. Topeka High will certainly present its challenges. The Trojans have rolled to an 8-0 start behind an offense that helps Topeka average 47.5 points per game. Quarterback Corey Thomas has accumulated 1,771 yards of total offense in his first year behind center with an incredible 50/50 balance of run and pass. Thomas rushed for 214 yards and two touchdowns in last week’s 34-10 win over rival Washburn Rural. Senior Mike McCoy leads the Trojans with 1,268 rushing yards on only 115 carries. Mc Coy and Thomas average 11.0 and 9.4 yards per carry behind a big offensive line that features the likes of Oklahoma State commit Tevin Jenkins. While exceptionally talented, Topeka High hasn’t been tested against a team of Free State’s caliber yet this season. The Trojans dropped this game at home last season, 53-37, and look for Free State to pull off the win in Lawrence on Friday night. The Class 5A District 4 championship is on the line on Friday night as No. 3 St. Thomas Aquinas travels to Hutchinson Field to take on No. 4 Pittsburg. The game has important implications on the seeding of the 5A bracket as well. Pittsburg can wrap up the No. 1 seed on the eastern side of the bracket with a win, while Friday’s loser potentially could have to face top-ranked Mill Valley in the second round of the playoffs. Expectations were high for St. Thomas Aquinas after finishing as the Class 5A runners-up a season ago in Randy Dreiling’s first year at the school. The Saints returned a lot of experience off of the 2014 team, but dropped a Week 1 showdown with Mill Valley, 38-20. Aquinas played early in the season without all-state caliber running back James Cosentino due to injury. His absence meant more carries for a number of other players and has resulted in the development of a lot of depth in the Saint’s backfield. Cosentino returned to action in a Week 3 win over Blue Valley Northwest then rushed for 190 yards the following week in a 41-21 loss to Bishop Miege. Sam Ramaekers leads Aquinas with 608 rushing yards and five scores, while Cosentino has 546 yards and five more touchdowns. Fellow seniors Jacob Leikam and Duron Lowe have added 458 and 419 rushing yards, respectively with a combined 10 touchdowns. Karter Odermann guides the Aquinas offense from his quarterback position. Odermann has rushed for 393 yards and 12 touchdown, while passing for an additional 562 yards and five scores. Pittsburg has breezed through its first eight games by outscoring its opponents by an average score of 48 to 6. The Purple Dragons haven’t played nearly the schedule that Aquinas has in the Eastern Kansas League, but Pittsburg has been impressive in consecutive wins over Blue Valley West (56-13) and Blue Valley Southwest (35-7). The Dragons are led by senior quarterback Spencer Turnbull who has completed 62 percent of his passes for 874 yards and nine touchdowns. Turnbull has added 336 yards rushing and six more scores. Running back Sherrick Rogers has rushed for 993 yards and 16 scores to lead the Purple Dragons. Rogers, who was an 8-Man all-state wide receiver in 2014 at Chetopa, is one of a number of Purple Dragons that have the speed to go 80 yards on any given play. The compliment to the speed on the edge is fullback Dante Menghini who has battered his way for nearly 550 rushing yards and eight touchdowns. The speed of Pittsburg’s defense has been its strength all season, but the Dragons will get tested physically on Friday. Pittsburg won 31-21 at St. Thomas Aquinas last season. The Dragons will need to limit the Saints success on first down and win the turnover battle to win for a second straight season. Abilene and Buhler have emerged as the top two defenses in Class 4A-I by a big margin. The Cowboys and Crusaders are the lone squads in the classification who have allowed fewer than 100 points. Abilene has permitted 70 points, Buhler 83. However, the Crusaders, long known for its great offense, have scored 327 points compared to 259 by Abilene. Abilene opened last season 6-0 and then lost all three district games. Buhler won 28-14 in Week 9 of the 2014 season and is 7-0 versus the Cowboys in the last decade. The Cowboys defeated Hays, 38-7, last week. Abilene’s most points allowed came in a 26-17 road win versus McPherson in Week 7. Buhler won its first two games by a combined 22 points before five straight blowouts. The Crusaders defeated McPherson, 44-28, last week. In 2014, Buhler fell in the sub-state championship game to Topeka Hayden and went 9-3. Buhler permitted 23.2 points last year, while Abilene allowed 14.2. The Crusaders have averaged at least 30 points a game the last nine years. A win Friday gives Buhler at least nine wins for the last eight seasons. Buhler earns the victory behind its Black Shirt defense and its offense led by standout quarterback Jace Williams and all-state running back Dillon Engelland. The Class 4A-I District 4 championship is on the line in Fort Scott on Friday where the host Tigers will take on the visiting Paola Panthers. Paola has won six consecutive games since their only setback of the season – a 23-7 loss at De Soto in Week 2. The Panthers committed two turnovers late in the second quarter of that game to allow De Soto to pull off the victory. De Soto score 10 points in the final 25 seconds before halftime on an interception return for a touchdown and a field goal after recovering a Panther fumble on the kickoff. After that tough loss, Paola posted consecutive close wins over Eudora (28-21), Louisburg (11-10), and Ottawa (10-7). Paola’s win against rival Louisburg was their fifth consecutive in that series and the fourth consecutive meeting decided by less than ten points. The Panthers trailed 10-3 in the fourth quarter before quarterback Ryan Gleghorn scored on a short touchdown run to pull within a point. Coach Mike Dumpert chose to go for the two-point conversion with 5:15 remaining – a decision that ultimately resulted in the Panthers’ 11-10 win. Paola defeated Labette County 55-14 to open district play in Week 7. Last week, the Tigers had to survive a late rally from that same Labette County team to win 28-25 and remain unbeaten in District 4. Fort Scott trailed 13-7 at halftime, but took the lead for good early in the third quarter on a Kaleb DeLaTorre touchdown run. Carter Young added a pair of touchdown runs for the Tigers to build a 28-13 lead early in the fourth quarter. Labette County added a pair of touchdowns to pull within 28-25, but Fort Scott recovered an ensuing onside kick and ran out the clock for the win. Fort Scott rushed for nearly 200 yards in the second half led by Carter Young’s team-high 112 yards on 20 attempts. Young leads the Tigers with 656 rushing yards this season and has scored 13 touchdowns. DeLaTorre has been effective throwing the ball this year nearing the 1,000-yard mark with 970 passing yards and six touchdowns. Senior Marcus Stepps has a team-high 483 receiving yards for the Tigers. Fort Scott will need to play well at home and use their balanced offense to try and slow down the Panthers. The classic “War on 24” has its 19th meeting since Oct. 2004. Silver Lake has won 15 of the first 16 during that span before Rossville broke through with victories of 24-14 in the regular season and 21-14 in the sub-state championship game last year. Rossville went onto capture the 2014 Class 3A title with a 14-0 record and the Bulldawgs carry a 22-game winning streak into the game. Rossville has looked dominant this season, while Silver Lake has squeaked by in back-to-back one-point overtime victories against Holton (23-22) and Perry-Lecompton (39-38) to open the season. Since then, the Eagles have won every contest by at least 27 points. Silver Lake is outscoring opponents 333-96. The Eagles have passed for 184 yards a game and rushed for 180. Junior Dalton Dultmeier has completed 84 of 143 passes for 1,370 yards with 16 scores against 10 interceptions. Four receivers have between 233 and 450 yards. Rossville has won each contest by at least 34 points. Rossville, like Class 6A Wichita Northwest and 4A-II Columbus, has an opportunity to break the all-time Kansas record for total yards per game. Rossville has 549 total yards per contest with a total score of 466-96. Senior quarterback Tucker Horak has enjoyed a terrific career and one of the best individual years in state annals. He has completed 81 of 99 passes (82 percent) for 1,250 yards with 19 scores against two interceptions. Horak has rushed 76 times for 1,405 yards and 25 rushing scores. As a team, Rossville averages 376 rushing yards a contest, 11 yards a carry and 45 rushing scores. Horak is arguably Kansas’ best playmaker and leads Rossville to victory. This game will decide the Mid-Continent League title and Class 2-1A, District 6. Both teams are 3-0 in district play with very similar scores. Phillipsburg is plus-63 in district play, Smith Center plus-60. Phillipsburg has a bevy of all-around talent, including freshman quarterback Trey Sides, senior fullback Brock Means and seniors Donovan Lumpkin and Kian Stegmaier up front. Smith Center counters with a backfield that includes Thayne Benoit, Chase Ryan, Cale Rogers and Kaden Meitler. Smith Center has enjoyed one of the state’s biggest turnarounds after a 5-4 season in 2014. Phillipsburg lost in the sub-state semifinals last year and has played several close games with a 6-2 start. The Panthers lost 7-6 to Norton in Week 2 and 34-32 at home versus No. 2 Sedgwick in Week 6. Phillipsburg also has a 20-12 win versus Oakley in Week 4. The Panthers have been a better road team this season, while Smith Center continues to play great at home. Smith Center is 4-0 at home this season, went 4-0 in 2014, and won its last three home contests in 2013. The Redmen are 7-4 in the last 11 meetings versus Phillipsburg, but have lost the last three. Smith Center, at Hubbard Stadium, collects the win.